Your pet hermit crab, one of more than 600 species of hermit crabs in the world, is among just a few species available as pets. 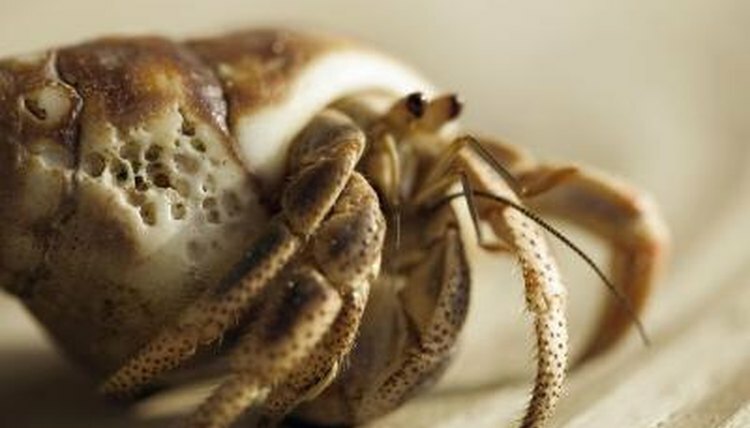 In the United States, traditionally two types of land hermit crabs have been sold as pets: Caribbean and Ecuadorian crabs. However, that's changing and some pet stores sell "exotic" crabs from well beyond the U.S. They include "strawberry" hermit crabs and the tawny hermit crab. Hermit crabs are anything but hermits. They're called hermit crabs because each one carries his shelter with him. In reality, hermit crabs are social animals that thrive in the company of other hermit crabs. They'll climb over each other for fun and sleep in piles. In the wild, they live in large networks that facilitate the trading -- and sometimes outright stealing -- of shells. The primary purpose of Hermie's shell is to protect his soft abdomen, but it also helps him regulate his body fluids and hydrate his gills. Yes, Hermie has gills, not lungs, so he doesn't breathe like we do. Because of this, he requires humid air to breathe, or he will slowly die of suffocation. Maintain a humidity level of at least 70 percent in his crabitat. A humidity gauge will help you monitor this important requirement. Sometimes a crab will decide he wants another crab's shell, instigating a shell fight that can require you to step in to protect the vulnerable crab. If one crab's being aggressive in the pursuit of a new home, try isolating him with a variety of shells to encourage him to choose a shell that's available. When a crab is looking to upgrade his shell, he's most concerned with the shell's opening size. He'll test this by reaching inside the shell with his large claw. If the shell works, he'll roll the shell around to dump out any debris and then start his transition. Provide him a variety of shells to choose from; just make sure they are sterile. With proper care, your hermit crab can be around for a good long time. The life expectancy of hermit crabs is five to 15 years, but 25 years is not uncommon and some have lived in captivity for up to 40 years. Crabs who come home from the pet store only to live in small containers have much shorter lives, sometimes just a few months. Hermit crabs living in a suitable crabitat have a much greater chance of living long, healthy lives. Hermit crabs aren't fussy eaters. They'll enjoy munching on just about anything you give them, and they seem to have a sweet tooth. Stay away from processed foods; sugar and salt can be harmful to Hermie and friends. They'll enjoy bits of fresh fruit and vegetables, meats, leaves and even bark. Wash everything you feed them or place in their habitat thoroughly to make sure they don't ingest potentially poisonous pesticides. Hermit crabs throughout the world vary greatly in size. The coconut crab, at about 16 inches long, is one of the largest hermit crabs in the world. The Ecuadoran hermit crab is one of the smallest, coming in at about a half-inch long.